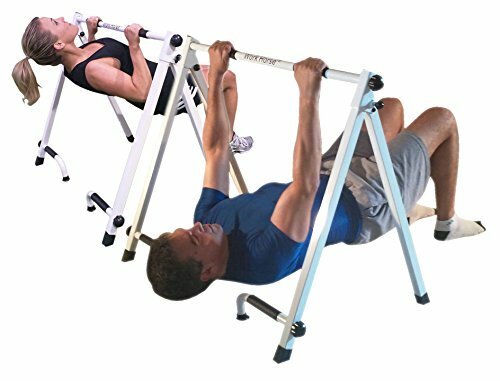 Portable Pull-up & Push-up Bar - For Inverted Pull-ups by WorkHorse Fitness at Strongman Pictures. MPN: 1001. Hurry! Limited time offer. Offer valid only while supplies last. My Pull-up Bar --- NO BOLTS....NO DOORWAYS....NO TOOLS REQUIRED! Get a Great Upper Body Workout in as little as 5 minutes. Pull-up bars are great!!! My Pull-up Bar --- NO BOLTS....NO DOORWAYS....NO TOOLS REQUIRED! Get a Great Upper Body Workout in as little as 5 minutes. Pull-up bars are great!!! if you can use them??? Unfortunately, most women can't do pullups and a majority of men can't do a set of pullups. My Pull-up Bar is ideal for both men and women who Can't do Pull-ups and want to add shape and tone to their upper body. Use My Portable Pull-up Bar in your living room, outside, the office, bootcamps, or on the road....it's PORTABLE! PULL-UPS and PUSH-UPS target all the major muscles of your upper body. PUSH-UPS hit your Chest, Shoulders and Triceps.....Half Your Upper Body! PULL-UPS target Back, Biceps and Forearms.....The Other Half of Your Upper Body! Inverted pull-ups are what 'knee' pushups are to push-ups. It helps you off-load your body weight! Made of lightweight steel, strong enough to hold a 300 pound person, up to 6 feet 4 inches tall. When you're finished, fold it up for easy storage. Created by nutrition and fitness expert Dr. Len Lopez. Workout in your Living Room, Outside, the Office, Bootcamps, On the Road - It's PORTABLE! If you have any questions about this product by WorkHorse Fitness, contact us by completing and submitting the form below. If you are looking for a specif part number, please include it with your message.